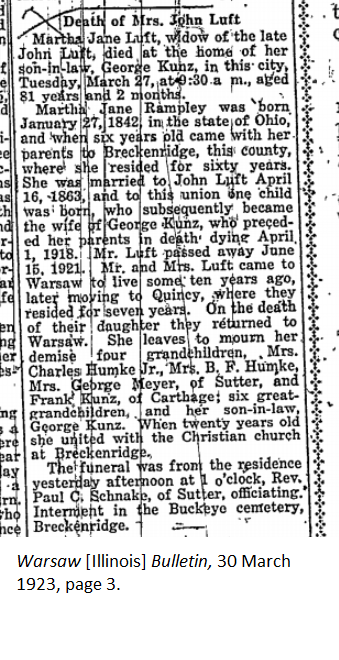 The obituary of Martha Jane Luft from the Warsaw Bulletin in March of 1923 mentions her daughter Maria twice–never by name. Martha’s son-in-law, George Kunz, is mentioned twice as well. The failure to mention the daughter by her first name is indicative of the time. Maria’s date of death is listed in her mother Martha’s obituary and all of Maria’s apparent children are listed as Martha’s grandchildren in the obituary. Based upon the obituary, it is reasonable to conclude that the grandchildren named for Martha are children of Maria as it’s clearly stated in the obituary that Martha and her husband, John Luft, only had one daughter. It also seems probable that Martha’s son-in-law, George Kunz, provided the information for the obituary given that Martha died in his home and that he had been married to Martha’s daughter. But his function as the obituary informant is speculative. A better way to get an idea of who might have provided information for the obituary would be to look at the death certificate for Martha. Hopefully since she died at the home of a relative, a family member provided information for the death certificate. It is important to remember that when Martha died she had no spouse or living children who could have provided information for the obituary or death certificate. While it is not stated in the obituary, Martha was the last child of her parents to pass away–thus the pool of potential people “in the know” was reduced even more. In 1863 he was united in marriage to Martha Jane Rampley, daughter of Mr. and Mrs. James Rampley, and to them one daughter was born, who became the wife of George Kunz. She preceded her father in death three years. Interesting that Martha’s obituary does not provide any names for her parents but her husband John’s obituary does. In a way this is actually a good thing if I contemplate the likely informant for a minute. As his widow, Martha likely provided the information for her husband’s obituary. The information in Martha’s obituary was likely provided by a son-in-law or grandchild. For this reason, I’m inclined to give a little credence to the names of Martha’s parents as being accurate simply for this reason. In this case, there are plenty of other records that provide information on Martha’s parents–but this was a nice little thought exercise to keep the mind thinking when the records are not available. everyone who was familiar with the family knew Maria’s name–it wasn’t news to them. And aren’t newspapers about news? ← Reasonably Exhaustive Search–Independent or Not?